Are you looking for a fun and effective way of promoting the spirit of cooperation in your K through 3 classrooms? Elaine Lindy shares three favorite folktales that will get kids thinking and talking about the importance of cooperation! After you use the tales in the classroom, why not send them home so the discussion about cooperation can continue? Included: Lindy shares follow-up activities and tips. Are you looking for a fun and effective way of promoting the spirit of cooperation in your K through 3 classrooms? Peek into a smoothly running classroom, and you're bound to see the forces of cooperating, listening, and sharing in action. 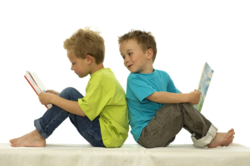 Telling fairytales and folktales is an excellent way of capturing the attention of children. You can communicate the "look and feel" of cooperation by delivering pearls of wisdom to your students through the genre they love best. The delightful folktales summarized below demonstrate the power of cooperative action. These stories have been tested and proven as hand-clapping favorites before groups of young listeners. Suggestions for related activities follow each summary. "White Wing's Escape" is from The Panchatantra, translated by Arthur W. Ryder, Chicago: University of Chicago Press, 1956, pages 214 to 217. The story begins when a hunter sets a giant snare in a spreading banyan tree and scatters grain to catch the attention of birds. White Wing, a ringdove king, and his flock notice the rice grains from high in the sky. They swoop downward and -- alas! -- are soon trapped in the hunter's net. As the hunter gleefully approaches the birds with his club, they realize their desperate plight. White Wing says to the ringdoves, "We must not panic, my friends. There is a way to escape from this terrible fate, but we must all agree to work together. The net is too large and too heavy for any one of us to lift. But if we all fly upward at the same time, I'm sure we can lift the snare and carry it away." The other ringdoves quickly agree. When White Wing gives his signal, the birds all fly upward at the same moment. They lift the snare and create what looks to the hunter, who watches in amazement, like a flying net rising on its own and vanishing into the sky. Are you looking for a fun and effective way of promoting the spirit of cooperation in your K through 3 classrooms? This week, Elaine Lindy, creator of the Absolutely Whootie Web site, shares three favorite folktales that will get kids thinking and talking about the importance of cooperation! After you use the tales in the classroom, why not send them home so the discussion about cooperation can continue? Included: Lindy shares follow-up activities and tips. "White Wing's Escape" is from , translated by Arthur W. Ryder, Chicago: University of Chicago Press, 1956, pages 214 to 217. Drawing. This story lends itself nicely to illustration. Discussion. Ask your students, "Name something you can do with a group that you can't do by yourself." List their choices on a board or chart. "The One-Turnip Garden" is from Ten Small Tales retold by Celia Barker Lottridge, New York: Margaret K. McElderry Books, 1994, pages 29 to 33. In this well-known Russian folktale, a giant turnip is too large for a farmer to pull out of the ground. His wife joins him, and then each of their children has a try. A variety of neighbors and strangers all join in the attempt. They hold on to one another's waists until, at last, they yank the stubborn turnip from the ground. Typically the story ends with turnip soup for one and all. In the version from Ten Small Tales, a little girl excluded from planting and tending to the turnip ("You are too little to do anything!") finds a way to help: She whispers encouragement to the turnip. When the entire line-up cannot tug the turnip out of the ground, she steps over to the turnip and whispers, "Little turnip, you have grown big. You have grown gigantic. Now it is time to come up. Come up, little turnip, come up." Then she takes her place at the end of the line. All the people pull their hardest once more and finally pull the turnip from the ground. Performance. This story works well as a short play because you can add characters to the line-up and include all the students who want to participate. You might add an animal, such as a dog, cat, goat, or a cow, to heighten interest. Even preschoolers can understand the concept and enjoy the drama. Suggest that when the turnip finally comes out of the ground, children fall backward like a row of dominoes. Discussion. Ask your students, "What would have happened if everyone did not want to help?" List their ideas on the board. "The Ram and the Pig Who Set Up House" is available online at no charge from Absolutely Whootie: Stories to Grow By. This folktale follows the formula of accumulation; more and more characters appear as the action proceeds. In the story, a ram learns the terrible truth about why the farmer feeds him so well, so he runs away from the farm. The ram persuades his friend, a pig who lives on a neighboring farm, to accompany him. The two animals set off together to build a house in the woods, where they plan to live by themselves. Along the way, they meet a variety of characters, each of whom expresses the desire to go along. Before the ram and the pig allow a new character to join them, the animal must describe how he or she can contribute to the house. At last, an eclectic group forms. The animals select a spot in the woods, build their house, and live in it together. A wolf notices the house construction and plots to invade them, one and all. When the wolf attacks, each animal fights back in his or her unique way. Together, the animals manage to frighten the wolf away. Performance. This story also lends itself well to performance because any number of animals can join the group and any interested student can participate. Each character must state what she or he can do to contribute. For example, the rooster can wake the animals in the morning, the hare can gnaw wooden pegs, the goose can pluck moss and stuff it into the seams of the logs, and so on. Discussion. Ask your students, "Why did the ram and the pig ask the other animals what they could do to help before they were allowed to join?" The responses below are a sample of what some kids said. Colleen, age 6: "To make sure they wouldn't be a burden." C.R.J., age 7: "They asked the animals to see what they can do, so it would be fair." J.K., age 7: "They asked what they could do to help build the house because it wouldn't be fair if one person did it alone." J.E., age 7: "So they wouldn't just lay around and not do anything." Folktales that illustrate the theme of cooperation lend themselves naturally to group activities. If you ask your students to illustrate a story, post all of the drawings on your wall. If your students discuss the story, be sure each child who wants to speak gets a turn. You might ask students in grades 2 and 3 to write about the story at home and then share (and read) their insights in class. Sending folktales home for family discussion provides an opportunity for families to reinforce the theme of cooperation. If your students perform a story, be sure everyone who wants to participate can. If necessary, divide the class into two sections so that one half performs while the other section watches. Then reverse the groups. Keep a story alive in the hearts and minds of your students by referring to it from time to time. You might say, "Now I'd like all of you to cooperate with one another, the way the ringdoves cooperated in the story about White Wing's escape, remember?" or "You can find a way to help the group, the way the little girl did in the story about the turnip." "Do you remember the story about the ram and the pig who set up house? Each animal had something special to offer, and they all helped build the house together." Ultimately, the strongest magic of all will be manifest as the story becomes part of the unique culture of your classroom. Elaine L. Lindy is CEO of Whootie Owl Productions, LLC, a Massachusetts-based company dedicated to storytelling that builds character. Whootie Owl Productions, LLC, founded Absolutely Whootie: Stories to Grow By, a Web site featuring dozens of fairytales and folktales from around the world. The site has been a USAToday Hot Site and a Highlights for Children TeacherNet Site and is recommended to teachers by Disney.